Just last year, the Toyota Camry was elevated to the next generation, getting completely redesigned to deliver more sportiness and sophistication than ever before. 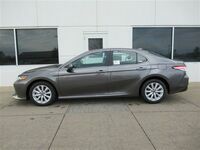 More appealing than any version preceding it, we are incredibly proud of the 2019 Toyota Camry in Moline IL, which looks to continue the trends that the 2018 model year version set into motion. The Camry isn’t just good looking, though, it’s also packed full of incredible content that makes its cabin as sophisticated as its exterior. Features and technologies abound both inside and out, delivering a more enjoyable driving experience each time you slide behind the wheel, and delivering an air of luxury at an affordable price tag. Let’s dive into some of the specifics to give you an even better idea of the things to which we’re referring. 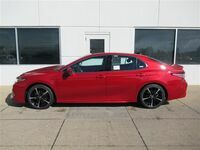 Toyota Safety Sense is one area of technology that sets the 2019 Camry leaps and bounds above many other vehicles in its segment and on the market as a whole. Featuring driver-assistive technologies like the Pre-Collision System with Pedestrian Detection, Lane Departure Alert with Steering Assist, Automatic High Beams and Dynamic Radar Cruise Control. Other incredible technologies include Bird’s Eye View with Perimeter Scan, Wi-Fi Connect Powered by Verizon, Intelligent Clearance Sonar with Rear Cross-Traffic Braking, Remote Connect, and even Apple CarPlay. The Camry’s performance is more fitting for a sports car as well, with an option of choosing between either a 2.5L 4-cylinder or 3.5L V6 engine. Each delivers a nice blend of performance and efficiency, with the former putting a great emphasis on efficiency and the latter on performance. Thanks to additional features like a MacPherson strut suspension system and Direct Shift 8-speed automatic transmission, you’ll enjoy every experience in the driver’s seat. 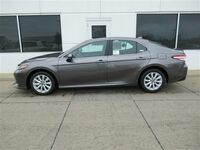 There is even more than what’s listed here to get excited about with the 2019 Toyota Camry, so if you’re interested in learning more or trying one for yourself, don’t hesitate to get in touch!